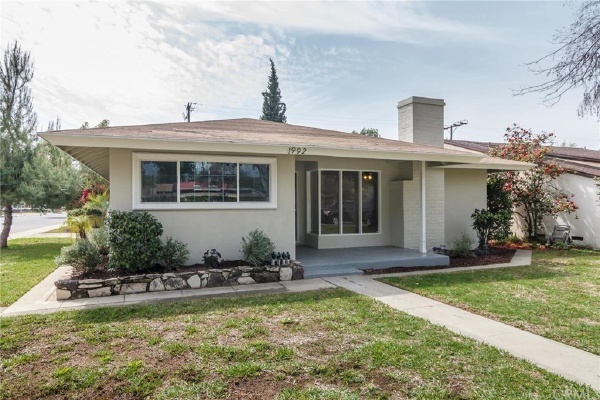 BEAUTIFULLY REMODELED CORNER LOT ON A QUIET CUL-DE-SAC. Great curb appeal with a green front lawn. Front door opens to hardwood flooring entryway and to a spacious living room that offers a fireplace. A huge kitchen features stone counter tops, stainless steel appliances, classic white cabinets over looks the over-sized family room. You get to enjoy Three spacious bedrooms with hardwood floors and master bedroom carpeted. The backyard features a concrete patio with built in gas BBQ Grill, Large crystal blue swimming pool, block walls on one side, concrete fencing on the corner side. Home also features gated RV parking. A two car detached garage with laundry center complete this perfect home! Only a one block walk to La Verne University and all local retail and coffee shops.....truly one of kind opportunity won't last.